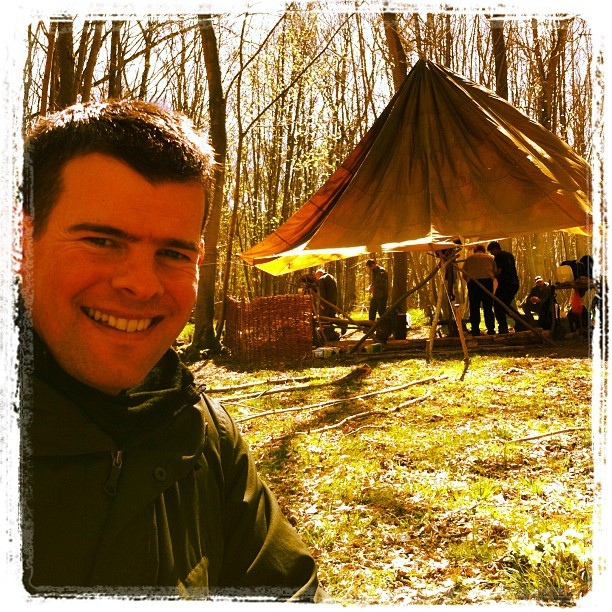 Recently I met fellow students of Woodland-Ways for a day learning to forage for wild resources. Our focus was not only food, but also plants with medicinal and artisanal properties, and those good for firewood and fire lighting. We enjoyed a glorious sunny day guided by Kevan Palmer, who is a senior instructor and genuine expert in wild plants. As we ambled, peered, sniffed, and nibbled our way round the woods it became clear that Kevan’s fascination with foraging is both highly practical and well researched. It was amazing to realise just how many common plant species have been utilised over the centuries by our ancestors, and what a wealth of nutrition and remedies are growing in our woods and hedgerows. Journeying through the common names for local flora was fun, ranging from the erudite Lords and Ladies, the medieval sounding Yarrow and Ale Hoof, to the aptly named Stinky Bob! I was interested to hear how one of the other instructors had put his plant knowledge to good use applying Yarrow to a cut which resulted in rapid healing without scarring. I learned that some plants considered a nuisance weed can have valuable properties. Uses for the Stinging Nettle are almost as prolific as the plant itself including; eating (after wilting to denature the stings) with a vitamin and mineral content which far out strips more common greens, cordage when the pith is removed and the strands twisted together, and curiously as a remedy to it’s own sting! Not for the faint hearted, Kevan demonstrated with decisive actions how to pluck, crush and extract the juice of a nettle without sustaining further stings, creating an immediate antidote for any unwary friend already stung. If grasping the nettle isn’t your thing then apparently Goose Grass is almost as good. Although identifying Goose Grass, or Cleavers is interesting given that every county has about three different local names for the plant. 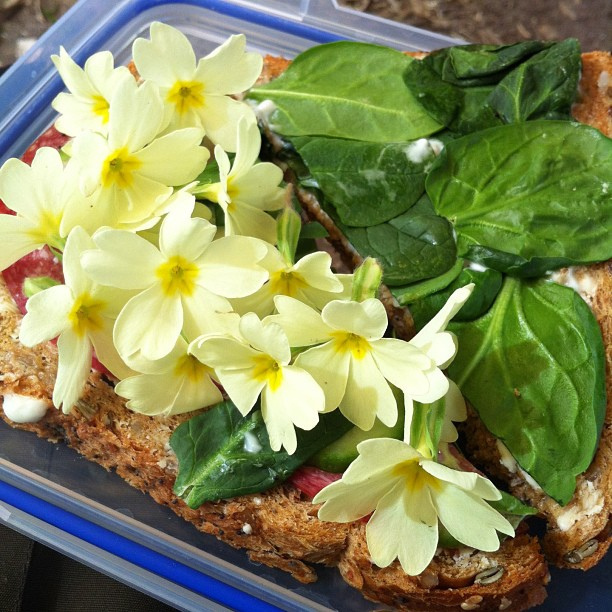 Salami and Primrose Sandwich – Delicious! I duly plumped up my lunch time sandwich with freshly gathered Primrose petals, and enjoyed tasting amongst other things; Hedge Garlic, Bush Vetch reminiscent of peas, young Hawthorn leaves, Wood Sorrel like apple peel, and the dried seeds of Cow Parsley with a flavour akin to Cumin. It became clear that correctly identifying flora is not necessarily a simple task given that the morphology and characteristics of each plant change with the seasons, and some within the same family can have radically different properties. Few more so than the Carrot family (Umbelliferae) where innocuous Cow Parsley which provides a delicate herb for fish, is very similar looking to its relative Hemlock which would be the last mouthful you ever tasted if unfortunate enough to eat any. Learning to forage with an expert to hand is definitely recommended! I am already looking forward to the Autumn Forage day where we may get to try some of the forest fruits and berries which will be decorating the woods. Next stop animal tracking later in May, I will let you know what we manage to spot before it spots us!